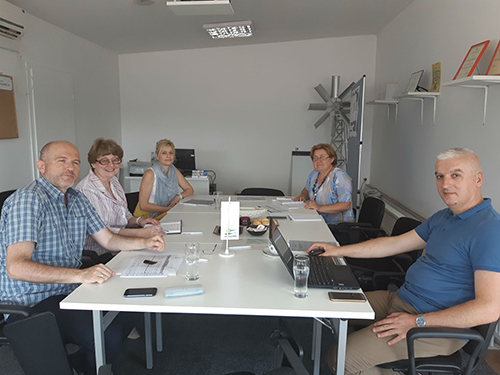 On 06.06.2018, the partners of the project “Fostering Rural and Environmental Tourism through Smart Tourist Information Centres” (FRET-STIC) held the first project meeting in CeProSARD premises in Skopje. The meeting was attended by the representatives of CeProSARD as Lead organization, as well as by representatives of the partner institutions - Municipality of Tetovo and Regional Development Agency (RDA) South from Kosovo. This EU supported project with duration of 24 months was officially launched on 15 may 2018. It is implemented under the IPA CBC Program between Macedonia and Kosovo. The action “Fostering Rural and Environmental Tourism through Smart Tourist Information Centres” / FRET-STIC is designed to support economic growth and social cohesion, through activities yielding enhanced tourism capacities in the Shara region in the action targeted territories. The project aims to contribute in development, promotion and presentation of local and regional tourism through innovative approaches and systems for improved rural and environmental experience. Establishment of networked Smart Tourist Information Centres (STIC), with capacity in collecting, utilizing and creating knowledge on the potentials of tourism in Shara Mountain and enhanced comprehension and presentation of tourism potentials of the cross-border region, using contemporary E-Systems and mutual cooperation. Target groups of the project are Municipalities, government agencies in-charge for regional development, tourism and culture, CSOs, SMEs, clusters of tourism, chambers of commerce and Tourism Information Centres.